This photo is NOT of the fateful play. It’s just cool. The focus is rightly going to be on the final two drives, Aaron Rodgers leading the Packers a combined 139 yards for two scores in a total of just 2:12, including a textbook 10-play, 81-yard drive that used up every last second of the 1:07 remaining. “It’s part of going against the best quarterback in football,” Richard Sherman said, before trailing off. “You give him a chance at the end…” Or the focus will be on Mason Crosby, nailing the game-winning FG as time expired and earning a measure of redemption one week after missing five kicks. All very important. But neither man would’ve gotten their chance to give the Packers their 33-30 comeback victory over the 49ers without Kevin King’s interception to set up the game-winning drive, and that wouldn’t have happened without the Packers risking it all on one all-out blitz. With 1:13 left in a tie game and the Niners facing a third-and-3 just on the outskirts of field goal range, a first down probably would’ve meant a San Francisco win. Packers defensive coordinator decided to send the house, rushing seven to try to pressure C.J. Beathard into doing something stupid. 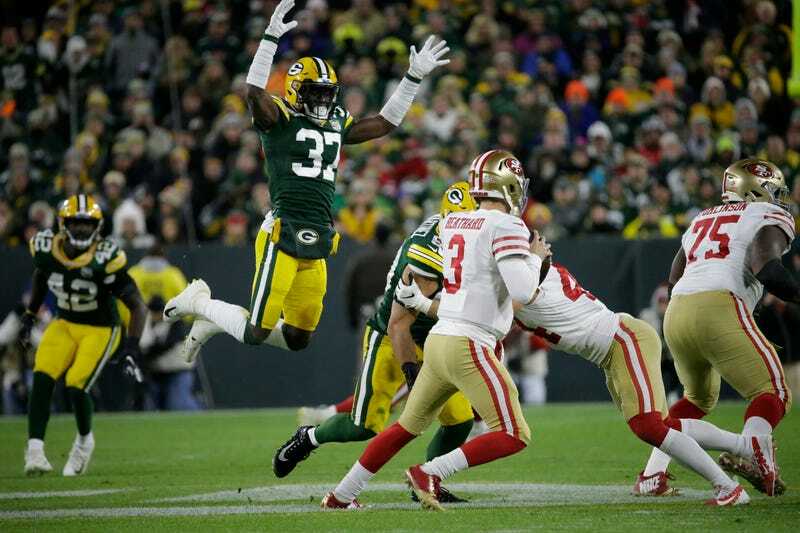 Safety Ha-Ha Clinton-Dix was among the pass rushers, and proved to be the free man, coming around Beathard’s protection and forcing an early throw. Clinton-Dix knew he had to make trouble for Beathard, or things were going to go very badly for Green Bay’s corners, stuck in what’s called a cover zero, with no free backs left to help out. “Kind of put our guys on an island on the back end,” Clay Matthews said. An awful lot had to go right here for the Packers. First, the blitz had to rattle Beathard, and it did. Packers corner Tramon Williams said he and King had an inkling their receivers were going to go downfield, and recognized it just in time before the ball was snapped. Without King getting that extra half-step head start to stay with Goodwin, without Clinton-Dix forcing Beathard to underthrow the ball, and without the Packers’ rush pressuring Beathard into making the wrong decision in the first place, Aaron Rodgers never even gets the chance for heroics. An all-out blitz can be a beautiful thing when it works, and a game-changer.